The Village People are ready for vacation! Why, hello there! And a hap-hap Happy Memorial Day to you! Get those flags a-waving and memorials a-going! What’s that? You don’t know what to do with yourself over Memorial Day weekend? Well, grab yourself a cold one, Mary, because me neither! While other people have barbecues or beach vacations to go to, my Memorial Day plans basically consist of sitting, drinking and sweating while watching the characters on Bloodline also sit, drink and sweat profusely. It’s called method viewing! If you hallucinate hard enough, it’s just like being in the Keys rather than a top-floor tenement apartment. That crazy man yelling outside is actually an exotic tropical bird if you dream! However, Bloodline is only ten hours of the long weekend. So what do you do then? Well, here at Filthy Dreams, we like to waste our time by binge-watching deeply shameful yet hilarious music videos. No irony, sarcasm or even, minimal self-reflection here. We want the most sincere, tacky, cheesy and eager videos we can find. Never forget: Sincerity is trash. Icons of schmaltzy disco gay culture, the Village People are so cliche at this point it makes most queers uncomfortable. Thank God! It’s downright subversive to say you are a huge Village People fan in 2016. 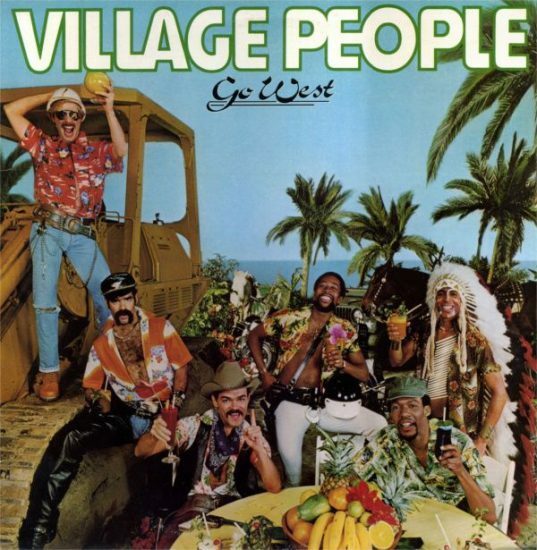 So I’m coming out as one today: I love the Village People, particularly the video for “Go West.” From the startling beginning “WOW WOW WOW WOOOOOOOOW!!! YEAAAAAH!! !” to the near-constant shouting, “Go West” is an anthem that tests the limits of the listener’s endurance. Just try to watch the Village People’s excited grins and arm-pumping without starting flail your arms with them….that’s right–it’s impossible. When Marion first sent me this video a couple months ago, I immediately started violently crying, screaming and laughing so hard I thought the neighbors were going to call the cops. Once I regained consciousness, I still had a hard time pinpointing what exactly it is about Kelly’s live performance that sent me spiraling. Was it her two backup dancers with their over-the-top dance moves who seem to have much more charisma than Kelly? The alien-like creature that appears to have grafted itself to Kelly’s face? Her shiny silver boots? The nauseated expression on her face that makes it look like Kelly wishes she could be anywhere else? I guess it’s all of the above, which is why I daydream about making my own version of this video. It is worth mentioning to you, dearest of dear readers, that the actual music video for the song is equally hysterical. Grrrrrrrr…..Eartha Kitt is on the prowl and boy, you better get out of her way as she looks for her man in this video. “Is there anyone out there who has the nerve?” she purrs in one scene. I’d say probably not. Kitt growls, sneers, leers, scratches, smokes and above all, stares intently and just a tad threateningly into the camera all while wearing a ridiculous poofy-shouldered satin dress. Even more than Kitt’s campy facial expressions, the set decor is possibly more envy-worthy. Where can I find so much leopard print? How about a poorly rendered bust of Michelangelo’s David with blue eyes? Filmed at the Numbers nightclub and video bar in Cleveland, Vincent Capretta’s “Nightstalker” is nowhere near as well-known as the rest of the musicians on this list but his contribution to shame makes him a legend in my eyes. I don’t really even know where to begin with a description of “Nightstalker.” Between Vince’s bouncy dancing, his sailor costume, his overenthusiastic falsetto, his sashaying backup dancers and his ode to his love for a…voodoo priest(?) (who knows), “Nightstalker” is a hot mess–an amalgamation of every ill-advised idea–and yet, it’s oddly captivating. Also word has it that Vince is now a priest. Can you blame him after this? Anything that Jimmy Somerville touches immediately makes me cringe like Laura Dern’s Amy in Enlightened. Just teeth-clenching and head-shaking. However, there’s something strangely transgressive about Somerville’s creative output–his music is impossible to reclaim for any contemporary queer political aims. Sure, you can resurrect, revive and recontextualize a lot of retro music but Jimmy’s will always be shameful as seen in his video “I Feel Love” with Marc Almond, as well as our bonus shameful video “Don’t Leave Me This Way.” With “I Feel Love,” Somerville, as well as the rest of Bronski Beat, takes Donna Summer’s disco classic and turns it into, as Marion terms, “gay elevator music.” Jimmy is pouring his heart and soul into this song but…it’s just not enough. Tags: Bloodline, Bronski Beat, Don't Leave Me This Way, Eartha Kitt, Feels Like I'm In Love, Films/Videos, Filthy Dreams Lists, Go West, I Feel Love, Jimmy Somerville, Kelly Marie, Marc Almond, Memorial Day, Music Videos, Nightstalker, The Communards, The Village People, Village People, Vince Capretta, Where Is My Man. Bookmark the permalink.